The Erchonia Percussor device is a hand-held mechanical adjustment/therapy device that is supplied complete – with NO ASSEMBLY REQUIRED. It is a portable, self-contained unit, designed for ease of use with a unique “Galvanic Wave” action head that provides comfort to the patient receiving percussion as well as more control to the Doctor providing the treatment. The variable speed feature of the equipment offers the practitioner the control to change speeds to the desired output giving the highest degree of control. Each Percussor package is subjected to a thorough Quality Assurance inspection in order to ensure the highest quality product that can be made. 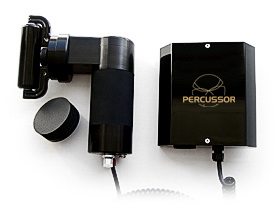 The Percussor operates with a set of two attachment tips. One cone head tip, (sent attached), and one flat pad tip. The tips “twist” on and off. The leather hand strap is sent attached for your convenience. The wall-mounting bracket for the control box has complete mounting instructions included in the packaging. Flat Roller, Spinal Roller. These attachments allow for the most effective and tailored percussive pain treatment.  Frost – The firm versatile plastic design allows the practitioner easy access of all parts of the anatomy. The Frost is not just for static trigger point application, but has the ability to slide over skin and clothing. It is ideal for long muscles like the IT band, SI issues and forearm flexors.  Cabernet – This firm rubber design works very good for “athletes” and patients that benefit from a firmer technique. The Cabernet is excellent for breaking up local, deeper adhesions and elongating fascia. It’s cylinder design is ideal for the scapular region as well. The attachment absorbs the uncomfortable sting of a firmer therapy technique.  Mint – This soft rubber design works on localized trigger point release. The Mint attachment is best used for static or stationary applications. The soft head is necessary for the “typical” patient and their tolerance to muscle treatment. It provides a big difference in absorbing the discomfort of a firmer head and has the right amount of give to apply the correct pressure for best results. Perfect for chiropractors and other doctors looking to provide pain relief/therapy.